This weekend, every GW pitcher seemed like an ace. The staff allowed a mere five runs in 28 total innings of play, struck out a combined 39 batters and led the Colonials to a weekend record of 3-1. 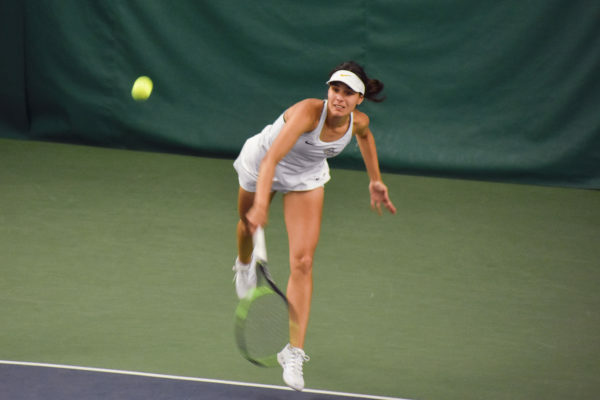 The GW offense started off the weekend struggling mightily Friday, when the team squared off against the Butler Bulldogs in what was the first of two games the two teams played this weekend. By game’s end, the Colonials fell victim to a no-hit shutout by a score of 1-0. The loss came at the hands of dominant pitching from both Butler (12-17, 3-3 A-10) starting pitcher Kristen Gutierrez (2-8) and relief pitcher Jenny Esparza who combined for the no-no. Sophomore Victoria Valos prepares to catch a pop-up. After a dominant outing of her own, Courtney Martin was tagged with a loss despite going the distance against Butler, surrendering only three hits, striking out seven, and allowing a single unearned run. The unearned run came in the seventh inning of the ballgame. 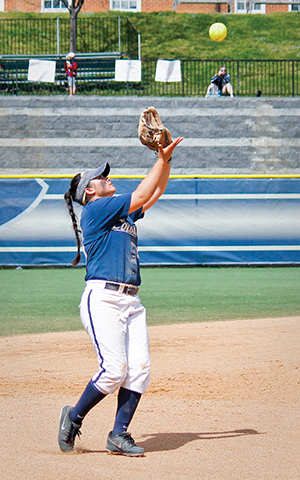 After Butler’s designated player reached base on a single to left field, the Bulldogs gained another base runner after a GW defensive error. After a sacrifice bunt advanced to runners to second and third, a sacrifice fly allowed the runner on third to tag up and score the only run of the ballgame. In the Colonials’ second game against the Bulldogs, GW was able to bounce back from Friday’s offensive slump, scoring four runs behind yet another impressive pitching performance. The Colonials took Saturday’s game 4-1 for their first A-10 victory of the season, snapping the six-game losing skid. The offense was powered by center fielder Autumn Taylor and shortstop Victoria Valos, who together drove in three of the Colonials’ four runs. Taylor went one-for-three with a triple and two runs batted in, while Valos went two-for-three with a single as well as her seventh home run of the season. Before Saturday’s game, Schramm made an adjustment in the pre-game preparation by implementing a full batting practice with hopes of refocusing the Colonial offense. Freshman Meghan Rico followed Martin’s dominant pitching performance with a gem of her own. Rico pitched a complete game, going seven innings, giving up six hits and one earned run, while tying her career-high in strikeouts with 10 against the Bulldogs. The Colonials were able to carry their momentum from Saturday’s win into a doubleheader Sunday where they faced A-10 rival Saint Louis. The Colonials looked unstoppable, sweeping the two-game series in convincing fashion, winning the first game by a score of 3-1, and the second game 5-2. In the first game, Martin rebounded strongly from her tough loss on Friday. For the second time on the weekend, she pitched a complete game, giving up six hits resulting in one unearned run, while striking out nine Saint Louis batters. Martin was also optimistic about her team’s ability to get back on track and finish the weekend out strong after the opening loss Friday. And unlike Friday’s game, the Colonials offense was able to produce solid run support for Martin Sunday afternoon. Once again, the GW offense was led by Taylor and Valos, who both went two-for-three on the game. Rico took the mound for the back end of the day’s double-header. Like Martin, Rico (8-7) had another impressive outing. In her five innings of work, she gave up two earned runs on five hits, while raising her career high in strikeouts to 11. 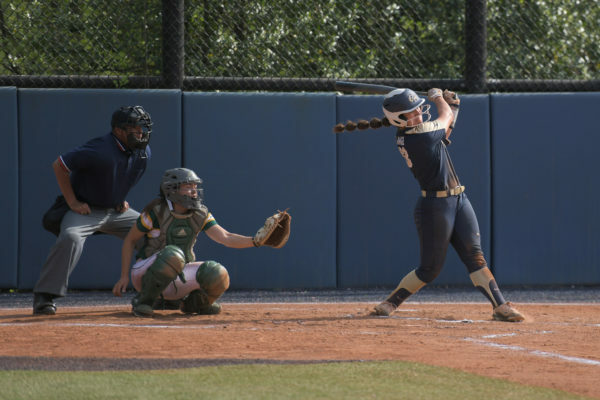 She was able to stifle hitters with her consistent accuracy on the inside part of the plate, which contributed to her 21 total strikeouts in her 12 innings of work this weekend. Martin came in to finish the Billikens off, pitching two innings of shutout ball, only allowing one hit and striking out two in her relief effort. The two pitchers served as the driving force behind GW’s weekend wins, something Schramm credited to the pitchers’ complementary and unique pitching styles. With Sunday afternoon’s win, the Colonials were able to flip their six-game skid into a three-game winning streak. And with a successful 3-1 homestand, Schramm said the team has returned to its winning ways.